When spring is in the air, it's also the time for parakeets to start mating. While your birds might exhibit breeding behavior at other times of the year, spring is generally when hormones are at their peak and mating is most likely to result in healthy chicks. To encourage breeding, place nest boxes in the parakeet pair's cage. 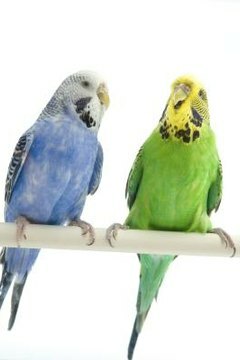 The age at which parakeets reach sexual maturity depends upon the species. The average parakeet, or budgerigar, reaches sexual maturity between the ages of 3 to 5 months, but that's really too young for breeding. Wait until your bird turns at least 10 months old if you're planning to breed budgies. If you're not sure whether your parakeet is male or female, look at the ceres, the skin above the beak that includes the nostrils. In males, the ceres is blue or purple, while in females it is some shade of brown. The same holds true for the feet -- bluish or males, brown -- or pink -- for females. Provide your breeding pair with the largest cage possible. Leave them alone as much as possible. The actual mating lasts a very short time, but you can watch the behavior leading up to it. The birds perch close to each other, with some "billing and cooing" going on. The hen might lift her tail or regurgitate food on the male -- a parakeet's way of showing affection. The male might start feeding the hen. Not long after mating, hens usually lay between four and six eggs, laying a new one every other day for a week or more. Female budgies sit on the eggs for 18 days before the chicks hatch. Totally helpless, naked and blind when they emerge, both parents care for the chicks during their first three weeks of life. After about 24 days, chicks leave the nest and can eat on their own. They can be removed from the family cage when approximately 1 month old. If you have a male and female parakeet and don't want them to breed, taking some simple steps can eliminate the chances of them mating. The easiest way to discourage breeding is by keeping them in separate cages. However, that doesn't necessarily stop breeding behavior, which still occurs in birds housed alone. Spaying and neutering is rarely done on birds because of often fatal complications, but there are other options. If your pet spits up food, lifts her tail or rubs her vent on you, put her back in the cage so she knows "playtime" is over. If you see her rubbing against toys or mirrors in her cage, these should be removed temporarily. Cover your bird's cage by 6 p.m., so artificial light doesn't fool her body into believing it's breeding season.